The last day of the trip begins in a hippie paradise and ends in the glare of Anaheim. Nutrition Business Journal Editor-in-Chief Rick Polito and aronia berry farmer Andrew Pittz set off on a journey from Boulder, Colorado, to Anaheim, California, visiting farms and interviewing industry leaders and politicians along the way to explore the connection between American agriculture and the dietary supplement and functional food industries. This is part five of five. Read the rest here. We never saw the miniature horses Caroline Duell told us to watch for. We had driven by several red fence posts, and more than one steep driveway. We ignored the admonition in her texted directions that “when you think you’ve gone too far, you’re not there yet,” and called her anyway. She was right, we were not there yet. When we do get to the end of the muddy road in the hills just inland from Morro Bay, she is standing at the top of her steep driveway and smiling. We quickly get the impressions that she smiles a lot. And this has been a very good year. That isn’t the only reason Duell is smiling. She has created a life for herself and her family at the end of this muddy road, and she has invited others into it. Permaculture classes get taught at the farm. She hosts meditation retreats. A builder taught a course in tiny home construction. The fruits of Four Elements Farms go out to farmers markets in the Paso Robles area. She shows us the orchards, the composting toilet, the greenhouse and drying room made with lumber and windows recovered from construction projects and demolition. She describes her home and her farm as a kind of laboratory for “anything and everything that relates to sustainable living.” She is living the hippie paradise dream. That’s obvious from the smile she offered when we got out of the car. What is not obvious is the entrepreneurial dream she and her husband, Ryan Rich, have made real. It wasn’t until we walked the grounds with Duell that we learned the extent of that dream. 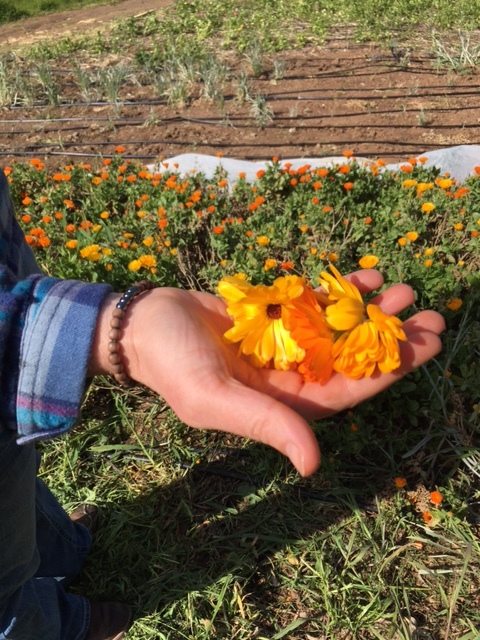 She had told us she rents a commercial grade kitchen nearby to create a healing balm from the calendula she grows, and we’d envisioned a table at the local farmers market, ointments sold with the pears and mandarins harvested up the hill from the calendula patch. Duell is the founder and force behind a $2.5 million brand growing at 40 percent year over year. We will see her booth at Expo West a few days later. We were standing in a hippie paradise and on the grounds of a B-Corporation enrolled in 1% for the Planet. That modest stucco home we walked by is also the headquarters for Duell’s efforts to promote Reef Friendly, a program educating consumers about the commercial sunscreens’ harmful effects on coral reefs. Duell settles into the story of how she made the dream come true. She talks about calling the every Whole Foods in northern California and delivering tubs of her All Good balm. She talks about the frustrations of dealing with distributors and the challenges and obstacles that might keep too many natural products entrepreneurs trapped in the dreamer stage. Right there, in that fold of hills, the green geological cul-de-sac, the why of our road trip comes into focus. Duell and her husband created a living example of best practices that stretches beyond the boundaries of the Four Elements Farm to touch coral reefs an ocean’s breadth away. This is an organic business that grew organically. Consumers can buy All Good Goop on Amazon, but the money is going back into everything Duell holds dear. There is no mansion at the end of the muddy road, past the red fence posts and the point when you think you’ve gone too far. Of all the “this is what we’re looking for” moments from our trip, the morning at Duell’s farm is the one that best makes clear the statement we sketched across the map when we planned the trip—a farmer helping build the better world where more farmers could see more of their own products to market. It’s what we set out to find. It’s what people like Duell set out to build. Back on Highway 101, we call Jim Hightower, the columnist and former Texas agricultural commissioner. American farmers, he says need to be set free. “The ‘free’ in ‘free enterprise' is not an adjective. It’s a verb,” he tells us. The natural products industry can “free” up farmers to create enterprises like Duell has done, he says. Much of the work Hightower did in Texas happened in the 1980s, but connections are easier to come by now than they were when farmers were isolated from the worlds of retail and commerce. A farmer can create a sales contract on a smartphone without climbing down from the tractor. New products can launch online and find their way to retail later. Crowdfunding can get a farmer and his value-added product a head start that was never going to come from selling eggs at a roadside table. We reach Annie Brown at the Rodale Institute who tells us that organic is just getting started. “I feel like there are so many avenues out. There are avenues that haven’t even been tapped, and more than ever, farmers are looking for ways to connect with the industry on different paths that haven’t been explored in the past.” A newly formed Organic Farmers Association is adding a collective heft to lobbying and marketing efforts, she explains. But all the way down Highway 101, every phone conversation echoes back to what we saw on Duell’s farm: an idea, and a patch of ground to plant it in. It’s late afternoon when we encounter the first clots and snarls in the failed experiment that is southern California traffic. We are far from anything that looks like a farm, and closer with every stop-and-go inch to Anaheim and the frenetic immersion of Expo West. Our last stop will be a garden in Venice Beach, and we arrive in time for sunset, wine and Dylan on vinyl. Our host, the gardener, is Michael McGuffin, president of the American Herbal Products Association. McGuffin joins us for the last 40 miles to Anaheim. He brings two small piece of luggage, but his more important cargo is the bag of herbs and greens he has harvested from his unlikely garden. He is making a salad, he explains, for the APHA board of directors, and he has gathered 23 different ingredients he grew himself. He appears more excited about the salad he is making than whatever he expects to see at Expo West. McGuffin never loses sight of the essence as it comes from the soil. Our last miles, an intricate turn-and-merge navigation through the rush hour complexity of freeway and carpool lanes, includes a spirited conversation between McGuffin and Andrew. Across half a continent, we have chased the idea of supplement companies partnering with American farmers to shore up a sometimes shaky supply chain and root a share of the prosperity in rural communities. Andrew, a young farmer, is committed to seeing that idea realized. McGuffin, an industry veteran, has seen too many companies in the industry he helped build look past origin and quality to work on price and margin. It is not an argument, but the discussion is spirited. Andrew believes a confluence of forces that include growing consumer concerns about where their food comes from and new technology and tools to trace and tell that story is building momentum toward the paradigm transformation he wants to see. He speaks of that paradigm while McGuffin worries about the pressures of price and the lure of profit. McGuffin can name only a few companies that are holding the line. But by the time we see the exit for Anaheim, the young farmer is closer to convincing the trade association president that the hope they’d shared in the garden could be scaled up to match the spirit of the industry the veteran insider remembers from earlier years. We pull up to the Anaheim Hilton with more than 2,200 miles on the odometer. We step out of the car. McGuffin grabs his luggage and 23-ingredient salad, thanks us for the ride and slips into the it-hasn’t-even-started-yet spectacle of Expo West. It’s been a long trip. We should be exhausted. Instead we are energized, even invigorated. We weren’t sure what we were looking for when we left. And then we found it at every stop along the way.